Elastic Cloud Gate portal can solve your problem of having too many snapshots generated by AWS Storage Gateway that makes the snapshot list almost unreadable. Why You Should Use Storage Gateway? The Storage Gateway is a secure way to transfer your data to AWS over SSL and stores data encrypted at rest in Amazon S3 and Amazon Glacier. It is durably backed up by Amazon S3 and Amazon Glacier. It is also compatible which means there is no need to re-architect your on-premises applications. It reduces the cost, maintenance and scaling challenges associated with managing primary, backup and archive storage environments. It is optimized for network efficiency. The Storage Gateway uses your internet bandwidth to speed up the upload of your on-premises application data to AWS. 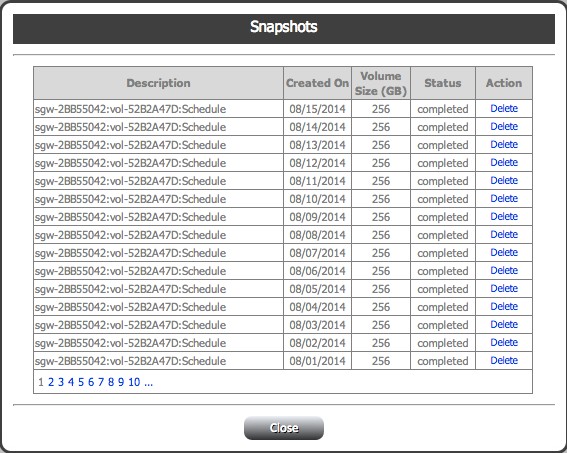 Schedule maintenance of your Storage Gateway snapshots that will delete old snapshots. The Elastic Cloud Gate is your best solution for the maintenance of your AWS Storage Gateway snapshots.